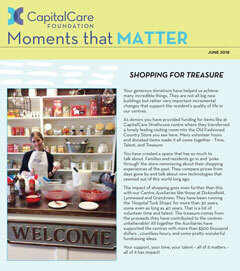 Welcome to the latest 2018 issue of the CapitalCare Foundation newsletter. Stories focus on sharing Foundation events, updates, and showing how your support as a donor and sponsor impacts residents and seniors in care at our centres. You can and DO change lives of residents and we are sharing the magic that you help create. To subscribe to our newsletter and event notification email list, please click here.